It was 6:30 in the morning when I finally arrived in a place I have dreamed of visiting for about 10 years. I had someone pinch me just to make sure it wasn’t a dream. After hurrying through customs and meeting our full time guide, Goulam, and Papitso, our driver for this leg of the trip, we were off. The first part of my trip was the areas around Andasibe. 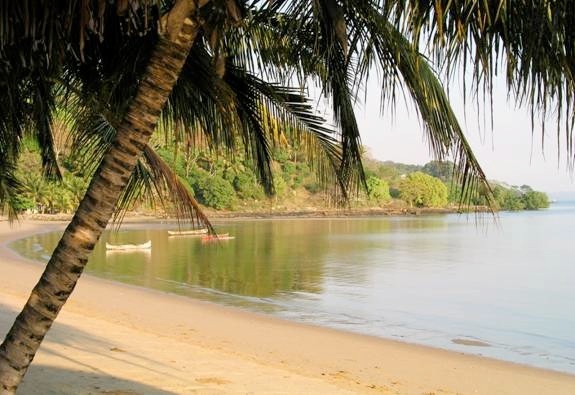 The car ride to this area takes a couple of hours from Tana. Once you are out of the city your heart really starts to sink when you see all the cleared mountainsides. After a few stops we made it to Mandraka. We stopped to stretch our legs and look for Calumma globifer. No animals were found, but we did not spend much time here. We needed to get to where we were staying so we could check in and drop off our bags. Once I had my things in my bungalow I was off to explore. The place we were staying at was located right next to Analamazaotra Special Reserve. The area outside the park offered lots to see. The first afternoon was spent searching the roadside and a small swamp outside the park. 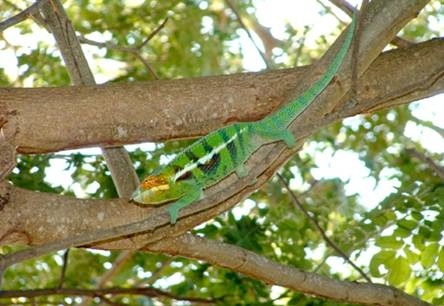 A few Phelsuma lineata bifaciata and Phelsuma pusilla hallmanni were found at the entrance sign to the park. 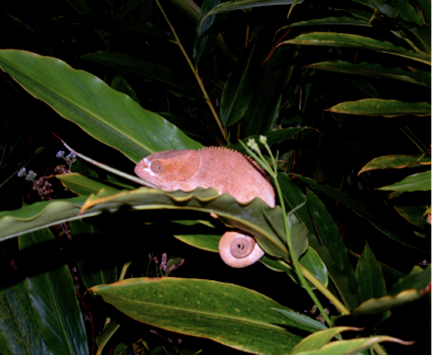 Later in the day after dinner we searched the roadsides by flashlight and the chameleon sightings began. The most commonly seen species in the area is Calumma brevicornis. 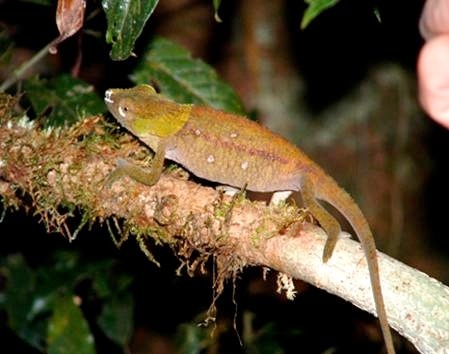 The other species we found were Calumma nasuta, Calumma gastrotaenia, a female Furcifer willsii, and a small juvenile Calumma parsonii cristifer. 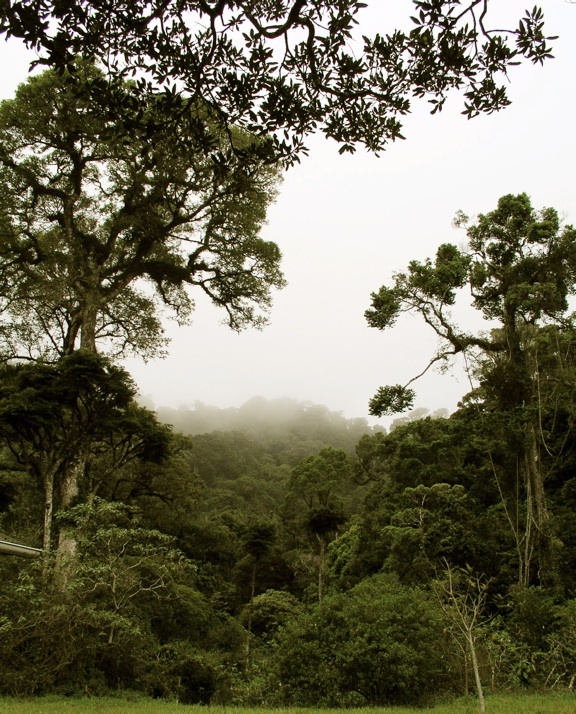 The first thing you hear piercing through the morning fog is the sound of the Indri indri making their presence known. Their calls can easily be heard from long distances in the morning hours. After breakfast we were off to the park. To see the inside of the park you need to hire a local guide, and this is not a problem. Many guides are waiting at the entrance to take the day’s visitors. The guide’s fees are not included in the cost to enter the park so you must negotiate. At the park entrance a male Calumma parsonii cristifer was placed within easy reach for people to get pictures. Also a few Calumma brevicornis and Calumma nasuta were nearby. 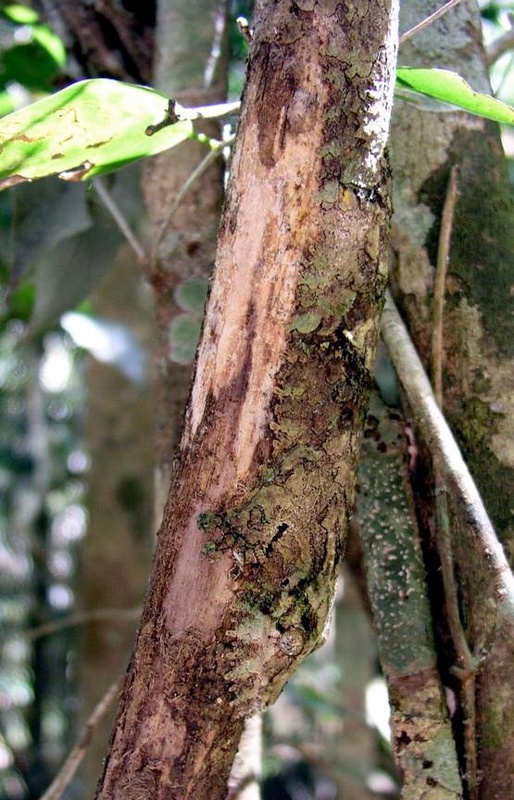 The C. parsonii cristifer was most likely placed in a tree so visitors would find it easily. Once inside the park our guide was quick to point out things you would never know where there. 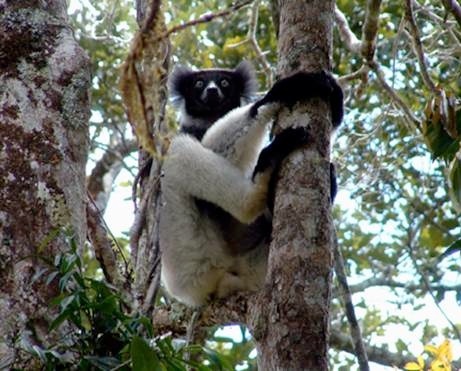 You couldn’t miss the Indri indri climbing through the trees. If you didn’t see them you could sure hear them. We dashed off trying to catch up to them for pictures. It was as if they knew what we wanted and they were kind enough to stay around us long enough to get some pictures and video. A little further into the forest the guide found a Uroplatus sikorea. I don’t know how he could possibly see the Uroplatus. 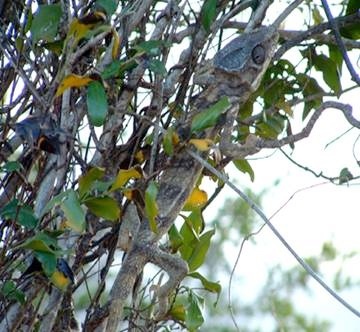 The trees that this species is found on are small in diameter but the sikorea are so well camouflaged you could easily pass right by them and never see them. We had stopped for a rest a few hours into the walk and sat on some benches. 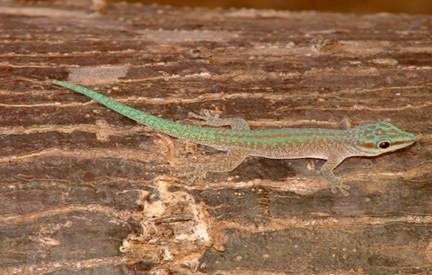 All around us the Phelsuma lineata bifaciata chased each other. While sitting we found a couple more Calumma brevicornis. After dinner that evening it was back out to search by flashlight along the roads. The second night proved to be just as good as the first night. In just spending a few hours walking up the road we found C. brevicornis, C. nasuta, and C. gastrotaenia. The C. brevicornis are interesting in this area. There seems to be two or possibly three different forms. The two defining characteristics of these forms is adult size - small and large. The larger form is the more plainly-colored of the two. 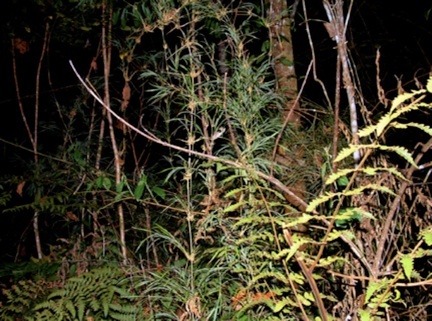 The next day was spent searching a large parcel of land about 10 kilometers from the park. During daylight hours we weren’t able to find any chameleons, but the nighttime search in this area was much better. After walking about 50 yards into the forest we found the first Calumma malthe of the night. A little further up the trail things really started to pick up. We started to find C. malthe babies. Altogether we found 10 babies that couldn’t have been more than a few days old. 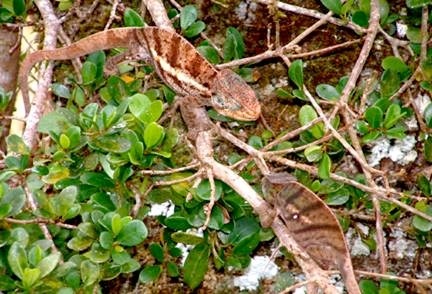 Other species we found were Brookesia therezieni and B. superciliaris. We had really wanted to find Calumma cucullata but none were found. The following morning was again spent back in the park. 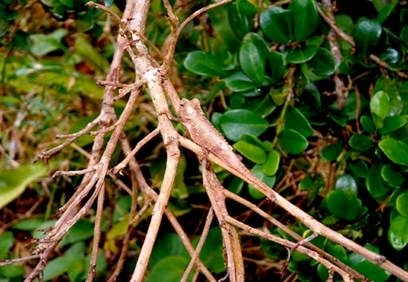 A couple of us and our local guide wanted to find Boa manditra, previously described as Sanzinia madagascariensis. 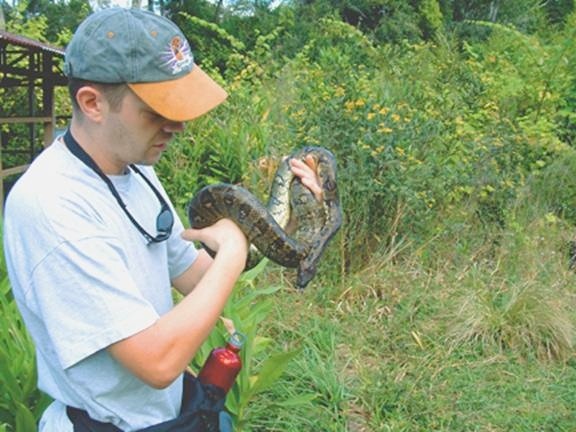 After about an hour the first boa was found near a rice field. A short time later we found another that appeared to have just eaten. This night’s exploring led us to some mountains within a half hour drive of our hotel. We again hired the local guide we had been using since our arrival. He told us he knew of a spot that we might like to see. A few of us made the long hike over two mountains and when we reached the top of the second mountain we stopped for a rest. 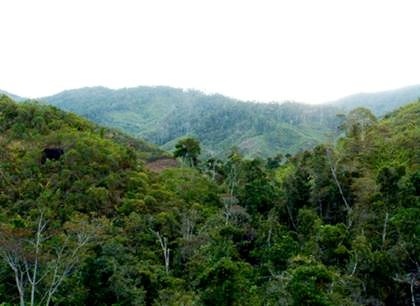 We could see a long distance from where we were and all we could see were mountainsides that were totally deforested. Our guide walked ahead while we rested to make sure that our hike was not going to be a waste of time. He returned about 20 minutes later with good news. The other side of the mountain we were on was not destroyed. When we reached the bottom we only walked about 20 yards up and out of the valley. Our guide told us to sit and wait till dark. Once it got dark we got our lights out and were surprised by the sight of baby Calumma gallus. As we looked further we finally found an adult male C. gallus with what appeared to be a male Calumma nasuta close by. It seemed odd that C. nasuta would be found here. Usually when C. nasuta was found there were many of them nearby. No females of either species had been found. 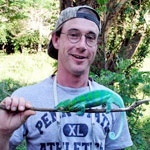 Our guide walked off for a short time and then we heard him yelling that he had found a Calumma furcifer. We spent a couple of hours in this area and no more furcifer males and no female furcifer was found. Having the chance to photograph C. gallus and C. furcifer was really exciting! We ended up finding a few more C. gallus babies before we left. This area was truly undisturbed. When you think of rainforest this was a perfect representation. The next morning we were off to Tana to catch a flight to Diego Suarez in the northern tip of Madagascar. 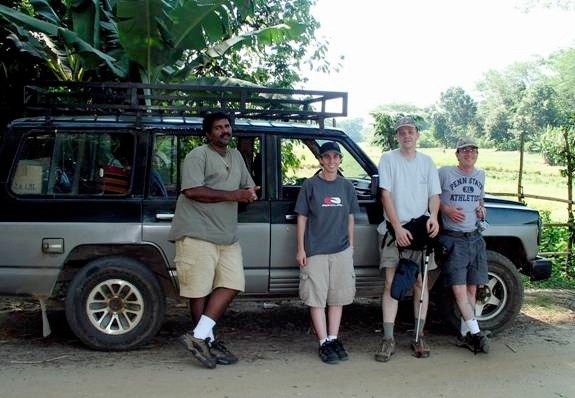 On the way to the airport we stopped in the region of Mandraka to look for Calumma globifer. We made a stop along the road and quickly found the typical Calumma brevicornis for this area. A male C. nasuta was courting a female close by. 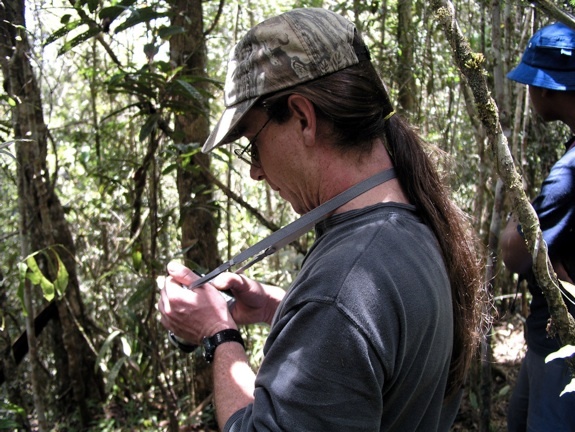 We walked up into a large forest and only after about 10 minutes found the first male Calumma globifer. He was a challenge to get out of the tree he was in but once I got him down he posed for pictures. Close by another male was found, but no females were found. 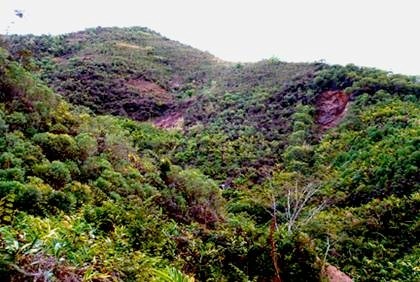 The climate in Diego Suarez is much different than around the Central-Eastern part of the island. It is hot and humid all the time and the temperature does not drop much, even at night. We spent the day driving to RamenaBeach. During the ride we stopped to look at the Furcifer oustaleti. 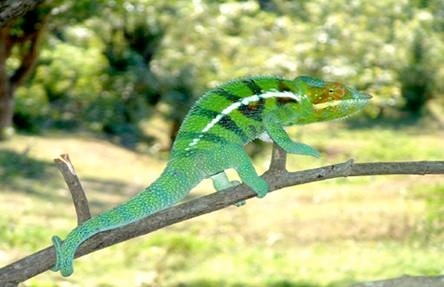 We only managed to find one Furcifer pardalis in really poor health. 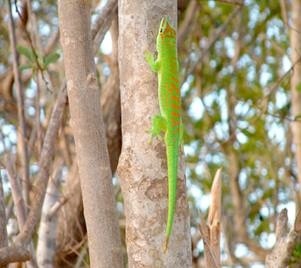 The Phelsuma madagascariensis grandis were easy to spot on the vegetation, which was brown and dry this time of year. The sunset was incredible! The early evening was spent at a fishing village watching the children. The children get so excited when you are taking pictures and they loved seeing themselves in the screens of our digital cameras. In the morning we set off for our next stay, Montagne D’Ambre National Park. The two-hour drive to the park from Diego Suarez doesn’t offer much to see. The area was dry and hot with only a few trees. As we approached Joffreville the scenery changed. The vegetation started to get greener the closer you got to the mountain until you are inside a dense, tropical rain forest that is noticeably cooler and wetter than Diego Suarez. When we stopped at the guard entrance to pay our entrance fees the guard told us there was a Calumma oshaughnessyi ambreensis near the building. We found the male and also looked for the Uroplatus that was around the building but we couldn’t find it. Phelsuma lineata dorsavittata were seen all over the guard house chasing each other around. The first afternoon here was spent on a walk through the park. The scenery all around the park is incredible! From certain stops along the walk you can see the crater of Mt. Amber. 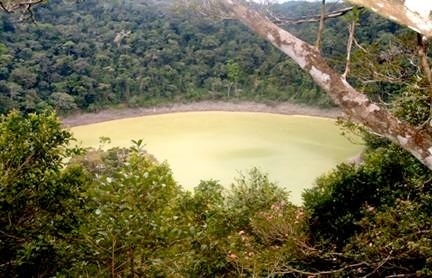 Since this volcano has been dormant for years the crater is filled with water, and is known as Crater Lake. 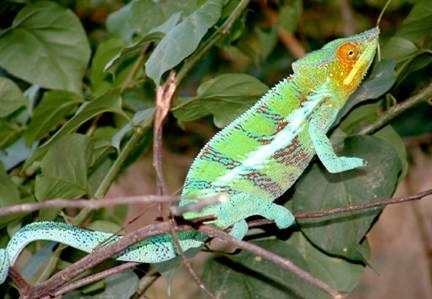 The first evening was spent driving slowly down the park entrance road to see what chameleons could be found. 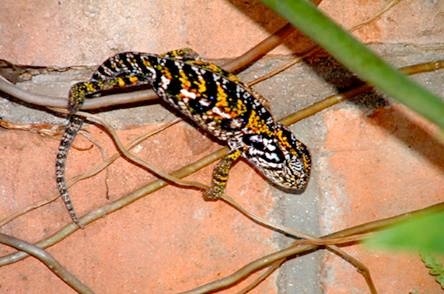 Calumma boettgeri can be found everywhere. C. brevicornis was also somewhat common but not in the same high numbers as C. boettgeri. 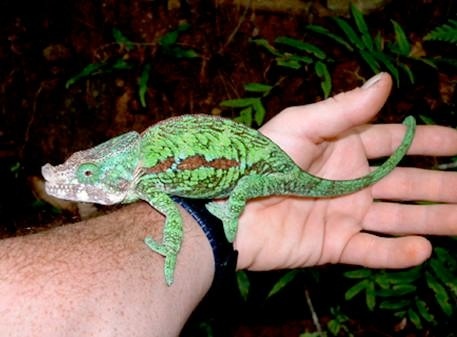 At the lower boundary of the park we found Furcifer petteri in the bushes along the road. Many females and only a couple of males were found. Once you drop below a certain elevation C. boettgeri is no longer found. 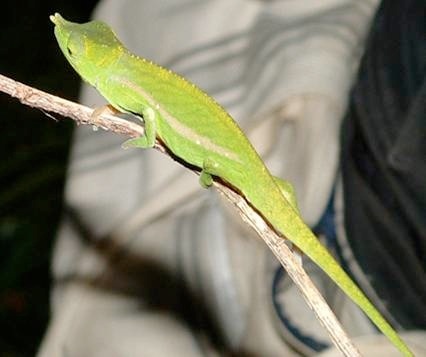 The only Furcifer pardalis found were a couple of juveniles. Once we got back to the lodge a couple of us were off to see what we could find. Since this area is wet all the time frogs could be found everywhere. A small stream nearby had a lot to offer. I was hoping to find Uroplatus ebenaui or Uroplatus frimbriatus but none were found. On the way back to the lodge we found a few C. o. ambreensis adults and mosquitoes were biting one male. The next day was rainy which made it perfect to get caught up on sleep. A school field trip was being held outside the lodge. 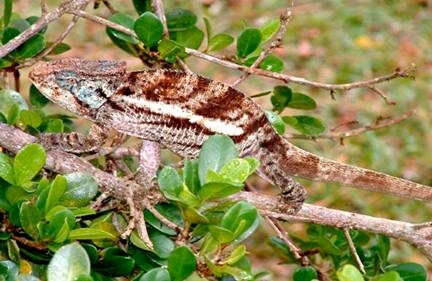 The teacher was teaching the children about all the chameleon species in the park and some of the other species on the island. Once the weather cleared up we went on another walk through the park, which took us to the other side of the mountain. Again some of the views were spectacular. 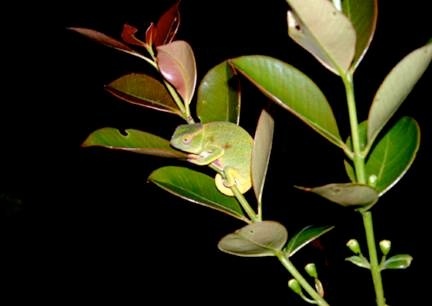 The second night was just as good for finding chameleons as the first. 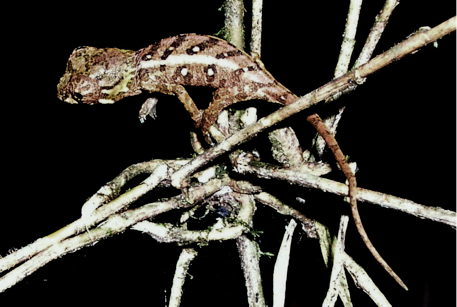 This night we concentrated on finding Brookesia. We went to the sign that had Brookesia minima marked on it. Our guide Goulam showed us where to look. He let us look for some time before he finally showed us where to look for them. 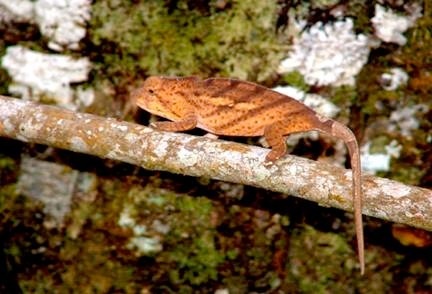 The animals we were finding were actually Brookesia tuberculata. At just over 1 inch, you have to look really hard to find them. We could only locate them on short tufts of grass. 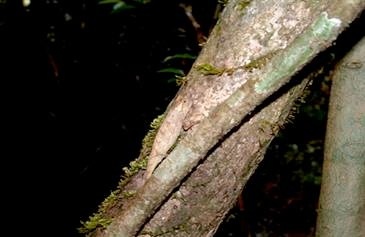 Brookesia ambreensis is found in many areas, but we found ours along the road. 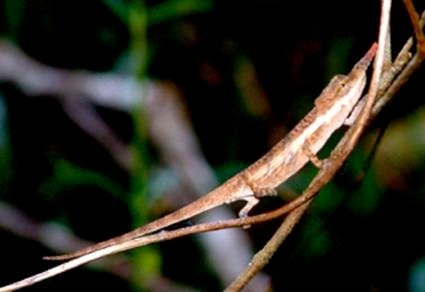 Three other Brookesia species were found but I have no idea what the species they were. 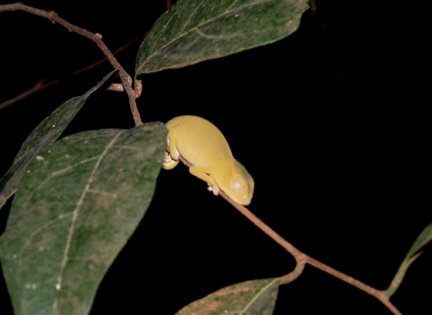 All of the larger species were found close to the ground on either small branches or in small bushes. Our next stop was Ankify on the Northwest coastline of Madagascar near Ambanja. This drive took most of the day and there wasn’t much to see early on in the drive since this area was dry and didn’t have much vegetation. In some of the small trees along the road you could find F. oustaleti. Once you get further into this region things start to green up. We made a stop in Ambanja for about an hour looking for F. pardalis. We did find a few males, but expected to find more. We didn’t go far off the road so maybe more animals would have been found. Once in Ankify we checked into our next accommodations. This place is outta this world! 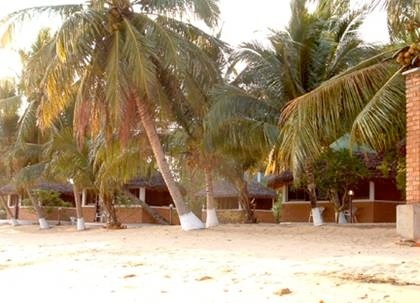 The bungalows are right on the beach and the waves rolled onto the beach 30 feet away. From Ankify we took a boat to get to the island of Nosy Komba. 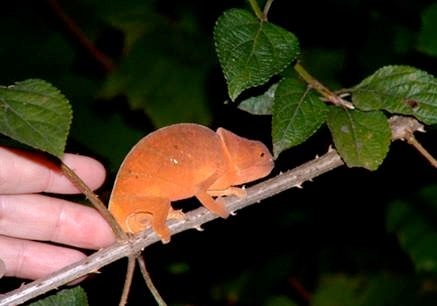 This island doesn’t offer much in chameleons but does have some nice F. pardalis. 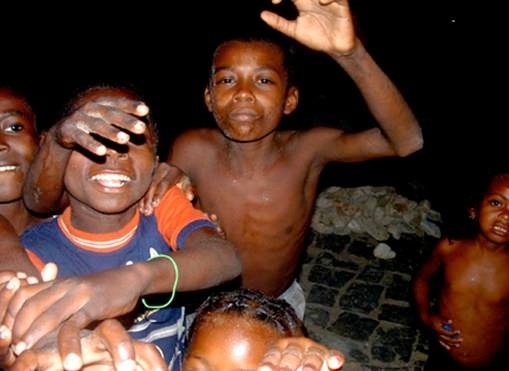 They closely resemble the pardalis from Ambanja. We spent the day shopping. The artisans on this island offer some nice woodcarvings. Once our shopping was done we headed off to see if we could find any chameleons. We managed to find a couple of males. The Black Lemurs here are really habituated to humans so they gather around waiting to be fed bananas. After we left the lemurs we headed to the beach for dinner and to wait for the boat. The next day we were supposed to head to Nosy Tanikely but we all decided we would just sit around and relax. It also gave us time to get repacked and organized before our next stay at Ankarana Reserve. We left this area early in the morning so we have more time to prospect the areas around Ambanja. Once again only a few pardalis could be found. This was really disappointing. I was told about trips in previous years to this area in which many pardalis were found. The males we did find were the typical looking form. The next stay was Ankarana Special Reserve. This is a very interesting forest! You would not think that such a dry forest would hold so many animals. After we got unpacked we were off to explore. The first place we went to was a sunken cave. If you’re into bats this is a great place to see. 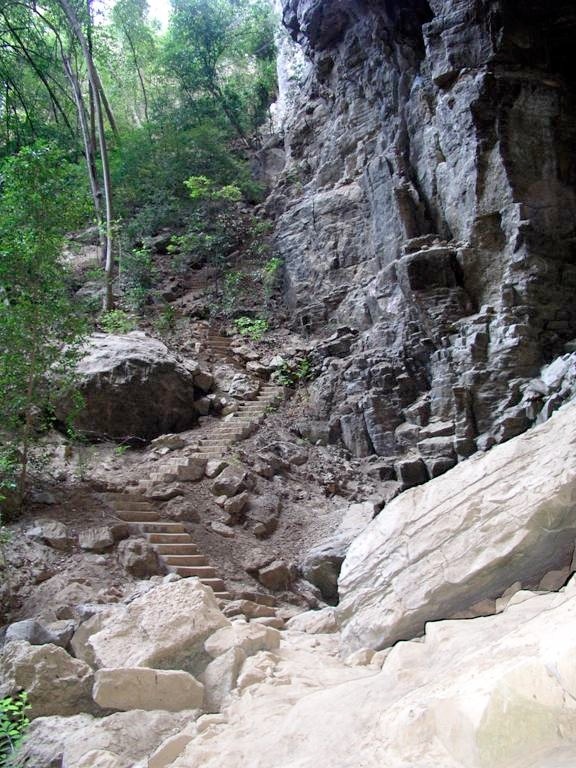 Once we were out of the cave we went to see a small section of tsingy. The nighttime search here was interesting. 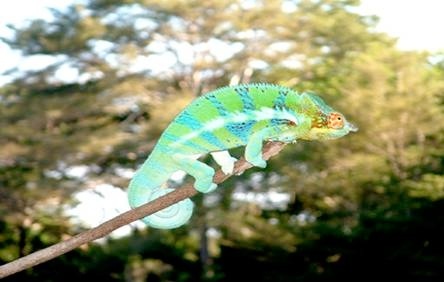 We had been told that Furcifer petteri has not been seen in some time in this area so it was a nice surprise to find a female roosted not far from our campsite. This was the only f. petteri found. The other species we found were F. pardalis (juveniles) and F. oustaleti. The next day we were off to explore a nearby section of forest. Since this is a dry forest I really had no idea what we might find. The things we did find are what you would not expect to see in this environment. 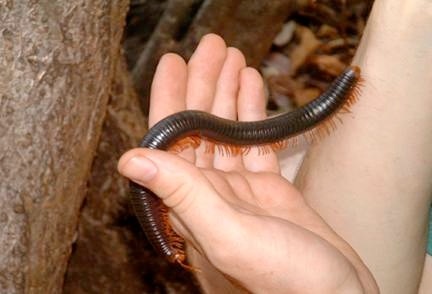 We found giant millipedes, giant pill bugs, Phelsuma abbotti chekei, and Homopholis boivini. After lunch we packed up and headed back to Diego Suarez. Once back in Diego we got to our rooms as fast as possible so we could get cleaned up. Since there were no shower facilities in Ankarana a long hot shower was greatly appreciated! We rested for a while and met up for dinner. After camping in Ankarana and sleeping on cots at Mt.Amber a nice comfortable bed to sleep in felt great! I was now coming to the end of my trip. Once back in Tana we visited the Croc Farm, a zoo that had all types of animals on display. The pens are open-air types with cement barriers to keep things in. 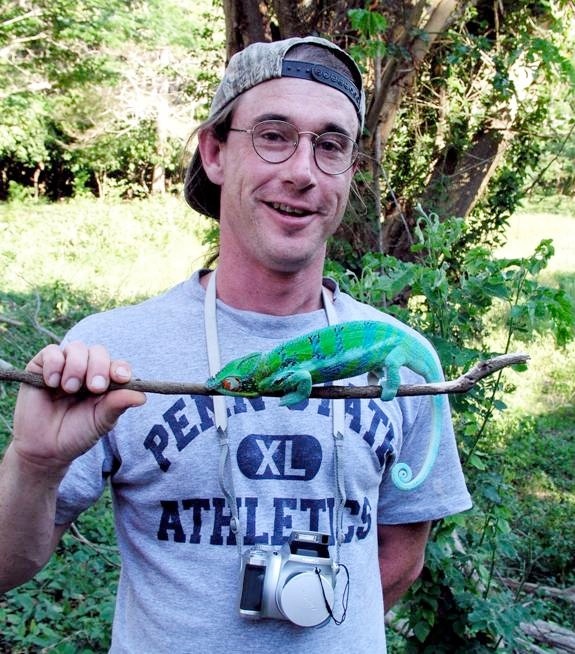 The chameleon pen was extremely overloaded with all types of chameleons from different parts of the island. The animals were so stressed most probably didn’t live for long. Another stop while in Tana was the FTM map store. 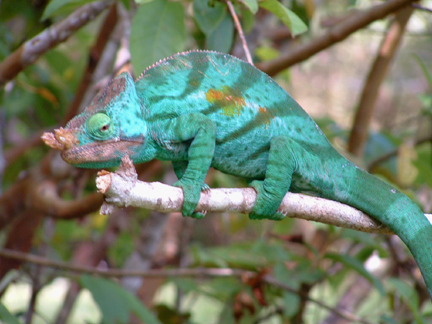 This is a nice place to visit if you are looking for detailed maps of Madagascar. 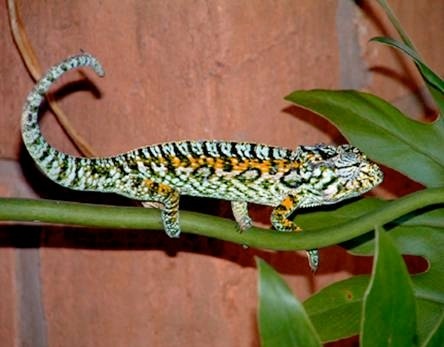 We met a South African gentleman who told us he had Furcifer lateralis lateralis in his garden. He invited us to his house to see them. Since we couldn’t find any F. l. lateralis in other places we looked we headed off to his house. This is one of my favorite species so I was quick to look for them. After a couple of minutes a pair was found. We were told the female laid a clutch of eggs a few days earlier. The man had marked the spot so that he could keep an eye on them. This was my last night in Tana. We went out to a nice dinner. I was surprised when the group decided to sing happy birthday to me. My birthday was coming up in a few days and I couldn’t think of a better way to be celebrating it. Even though I knew my trip was at its end I didn’t want to leave. I could stay there forever! I will never forget my first trip to this amazing place, nor will I ever forget the people I lived out a dream with. The other travelers on this trip were Ardi Abate, Airn Chamberlin and Matt Arnold. I had such a great time with you and will never forget the time we spent together. To Goulam who made us all feel comfortable and safe. I never felt the least bit of worry when you were around. Most of all I want to thank Ardi. You made this dream become a reality! With all your careful planning and knowledge of Madagascar you made sure I had a trip I would never forget. Thank you!